I watched the September 25th, Sunday NBC program called “Education Nation” hosted by Brian Williams. It was a Teacher Town Hall Meeting filled with teachers talking about teaching and the state of education. They came from all over the country. They taught in a large variety of public school systems, charter schools, teacher controlled schools, parent owned schools, and at all grade levels. Their backgrounds were from tenured to first year teachers, rural to big city schools, and from every walk of life imaginable. The teachers were well represented and candid. This post will discuss teacher salaries. The next additional posts on this subject will discuss each point listed above. · According to teacherportal.com first year salaries range from $24,872 to $39,259. · An average salary for teaching across the nation is $33,950. · With 10 – 19 years the average salary is $48,088. · With 20+ years experience the average salary is $56,055. · U.S. teachers work about 1,913 hours over a 180 day school year that is 36 weeks long. 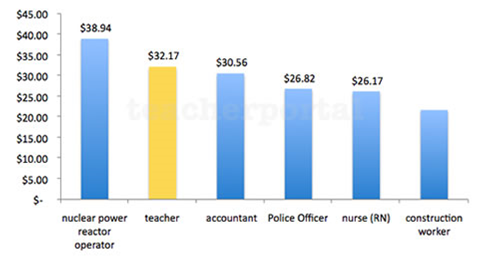 The average teacher’s hourly wage is competitive with many professions as indicated in the chart below. Teachers get the summer off and are able to supplement their wages through summer school, summer work, tutoring, coaching or other means. Teachers receive state benefits, pensions, and have a secure career with a retirement that is independent of social security. According to a survey conducted by the NEA (National Teachers Association) Teachers spend an average of 50 hours per week on instructional duties, including an average of 12 hours each week on non-compensated school-related activities such as grading papers, bus duty, and club advising. This averages to 62 hours per 5 day week. Very little of this time is spent working directly with students in activities such as tutoring or coaching; far more time is reported on preparation, grading papers, parent conferences, and attending meetings. Teachers have a long week of which some is compensated and some is not. They have the summers off when other professionals do not. The question was asked on Education Nation if teachers thought they should receive higher salaries – 74% in the room said yes, the national survey reported 75% of the teachers said yes. BUT, interestingly there were 10 other items that ranked higher in the survey. Melanie Allen, a Boston teacher said, “This (teacher salary issue) really strikes home for me because when I know passionate, excellent teachers who’ve left the classroom, it’s not because of lack of dollars, it’s lack of voice. We want a chance to be the decision makers. We’re on the ground, we know what needs to be done and we want the chance to do it.” I say BRAVO Melanie! Teachers are not well represented by their unions or their spokesmen when it comes to their image, devotion, hard work, and determination to help their students succeed. Most have a passion for what they do and they need a voice, not only over what goes on in their schools, but on the national level where many of us are ready to hear them speak. We want to hear from the teachers who are on the front lines, not the union bosses who sit in their offices sipping coffee with their large salaries taken from the union dues teachers supply. Do they want more money? Yes. Are there 10 other things that are more important to them? Yes. They don’t teach for money; they teach because they love what they do. More to come in my next posts about what teachers want.